It’s that time of year again! 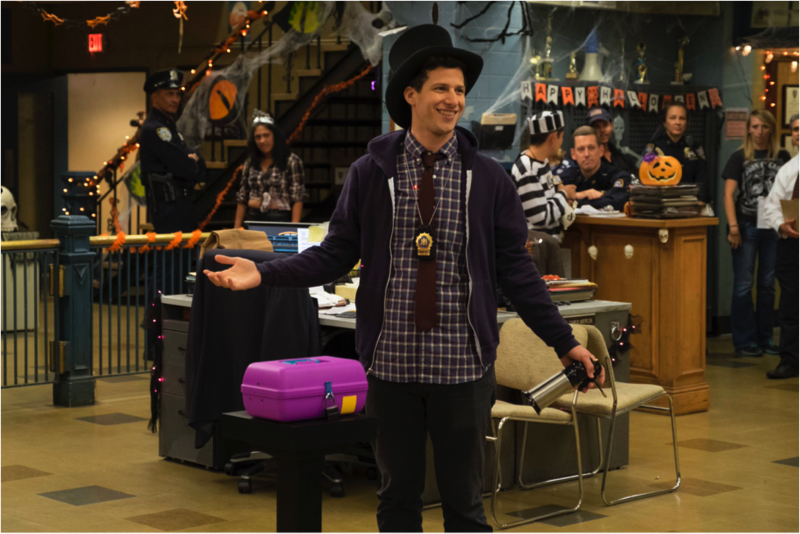 An epic Halloween Heist episode is a tradition on Brooklyn Nine-Nine, and the show creators have pulled out all the stops to make this year the best one yet. Things are heated between the opposing teams right off the bat. As defending champion, Amy takes it upon herself to announce the heist, much to Jake’s annoyance (he’s always the one to announce the heist). 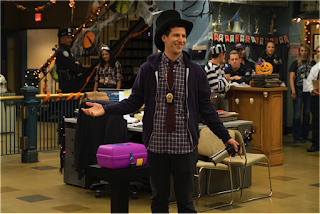 Then Holt walks in, complete with marching band, to announce the heist as well, claiming he’s the last legitimate champion (since no one even knew Amy was playing last year until she swooped in and won). Jake declares this year’s heist a three-way tie breaker between his, Amy’s, and Holt’s teams. They will be playing for a plaque that reads, “The Ultimate Detective/Genius.” The plaque will be housed in Amy’s old Kaboodle, which has been locked with a brand new padlock that Hitchcock promptly swallows the key for. The Kaboodle-with-contained-plaque will be placed in the middle of the precinct, in full view of everyone. As Holt explains, whoever possesses the plaque at sun-up wins. Also, side note: I am way too excited about the fact that I, too, used to own a Kaboodle. Mine was dark blue with sparkles and a silver latch. Ah, the '80s. I’m old. Anyway! Moving on. Terry tells them heists are dumb and he has too much work to do anyway, so will be sitting this heist out. No one believes him; they all assume he’s lying so he can sneak in and steal the victory for himself like Amy did last year. He denies it and goes back to his desk to work. I’m not buying it either, Terry! Jake assigns Hitchcock and Scully to keep tabs on him. That only leaves Gina, Rosa, and Boyle. Amy gets to choose first and goes with Rosa (a wise choice). As the winner before Amy, Holt chooses next. He throws them all for a loop by choosing Boyle. Jake always chooses Boyle and had his whole strategy planned around working with him, but now he’s going to have to make his plan work with Gina. Gina is mildly insulted that Jake thinks she’s inferior to Boyle in any way. Jake explains that his plan centered around a body double of Boyle he found and so yeah, it’s going to be tough making the original plan work with Gina who, thankfully, looks nothing like Boyle. Amy and Rosa are busy getting down to business. Rosa has full faith in whatever plan Amy has already come up with, much to Amy’s glee. She’s already put together a virtual binder on an encrypted flash drive, plus she has a 3-D holographic model of the precinct hidden inside a keychain. All I can say is we should all be grateful Amy uses her nerd genius powers for good. Things aren’t going as smoothly on the Holt-Boyle team. Holt doesn’t trust Boyle and refuses to let him in on the plan, assuming he’ll run to Jake with the intel. Holt explains that his sole reason for choosing Boyle was to separate the dream team and now Boyle’s services are no longer needed. While the three teams cultivate their plans of attack, Terry is the only one actually working. Hitchcock and Scully have followed him into the file room, demanding to know what his plan is for the heist, much to his annoyance. Jake and Gina are the first to set their plan into motion. 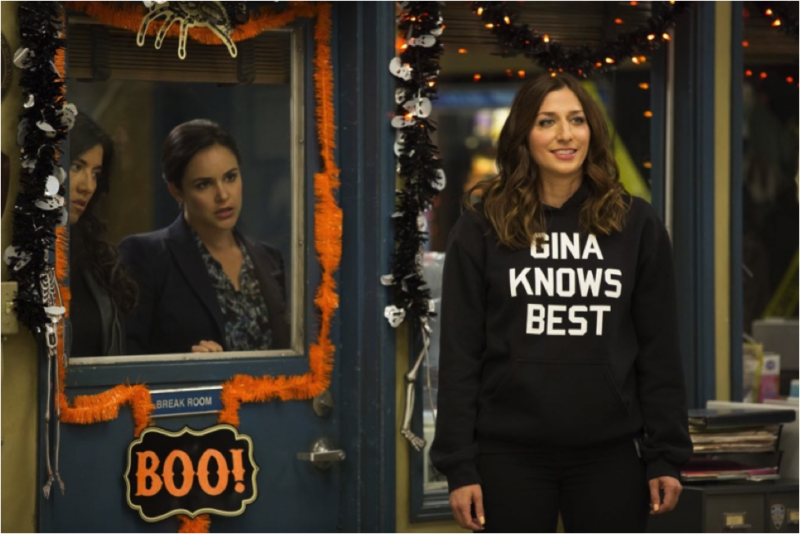 They’ve miraculously found a Gina-esque wig for Bill, the Boyle body double, as well as a matching sweatshirt. While he pretends to be Gina, the real Gina sneaks off. Jake explains to Bill that he snuck into the precinct early that morning and replaced all of the locks, so that the offices where the other teams are camped out all lock from the outside. Hidden behind a mailroom cart, Gina locks the other teams in, and then Bill reveals himself as the Gina body double. Jake swaggers out, breaks the Kaboodle lock, and holds up the plaque for all to see, declaring himself the winner. It’s not over yet, though. Sun up is a long way off and a lot can happen. Holt, unable to pick the lock fast enough, throws a chair through his office window and jumps out, rushing at Jake, who throws the plaque to Gina. Gina, who happens to be on roller skates, catches the plaque and tries to skate away but smashes face first into a wall, breaking her two front teeth. After depositing Gina on the sofa, they get back to business. Jake begs Terry to be his teammate now that he’s lost his, but Terry still refuses. Jake believes that, since his team was in possession of the plaque when the accident occurred, he should get it again with a four minute head start. Unfortunately, everyone else (even Boyle!) votes against him and decides the plaque should be reset. Holt, impressed that Boyle stood up to Jake, thinks maybe he can trust Boyle after all and decides to let him in on the plan. With no other options, Jake has asked Bill to be his teammate. Meanwhile, Rosa has read Amy’s entire virtual binder, as well as the suggested reading of “Chrissy’s Big Day” from The Babysitter’s Club series, and is ready to spring into action. Just then, a pizza delivery guy arrives with a pizza for Holt. Holt hates pizza and Jake is convinced this is a ruse. Holt denies that the ruse is his doing. As Holt, Jake, and Amy all argue, dozens more pizza delivery people arrive, causing a massive distraction. When they’re finally able to get the pizza people to disperse, they find the Kaboodle on the floor, broken into, the plaque missing. The teams argue about who did it, but we find out a few minutes later that it was, of course, Amy and Rosa. Only Amy could synchronize that many pizza delivery people at one time, enabling Rosa to impersonate one and, in the commotion, steal the plaque. They hide it in a wall vent in the women’s bathroom, planning to keep it there until sun-up, when they can declare themselves the winners. Amy thinks she’s the only one who knows about this little hiding place – it’s where she keeps her secret stash of cigarettes (since when does Amy smoke?!). It won’t be that easy, though. Holt knows they have the plaque and he’s well aware of Amy’s hidey-hole. He reveals his secret weapon to Boyle: over the past month, he’s been training his dog, Cheddar, to retrieve plaques. He puts the pup in the wall vent in his office and Cheddar makes quick work of zipping through the vents and grabbing the plaque. Holt never should have put his trust in Boyle, however. Jake quite easily manages to get Boyle to spill all his secrets and finds out that Holt has the plaque and has hidden it in a box in the file room. Jake grabs it and stashes it in his own desk. They immediately suspect Terry. After all, he’s been telling them heists are dumb the whole day. Rosa, Amy, Jake, Boyle, and Holt all go to confront him in the interrogation room he’s been working in. Terry is fed up. He has been working this whole time and still swears he has nothing to do with it. Just then, the lights go out again and the interrogation room window lights up. It’s Gina! And she has the real plaque! Gina explains she was the one in charge of ordering the plaques, so she simply ordered four of them — one real one and three fakes. She also manipulated Holt into choosing Boyle as a teammate by constantly reminding him that Jake is helpless without Boyle. 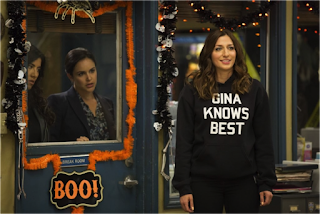 When Holt chose Boyle, Jake was then forced to choose Gina, which was also part of her plan. Turns out, she knocked her real front teeth out back in fifth grade and wears false ones so it was easy to pop them out and make it look like she’d knocked them out right then with a little fake blood. This allowed her to swap out the real plaque for the first fake one that went back in the Kaboodle. Gina then left for a fake dentist appointment, giving her time to change into Amy’s clothes — which are so drab they made her invisible, she says. This allowed her to sneak around and put a fake plaque in each hiding place. She also knew Terry would refuse to participate on the pretense that heists are dumb. Terry calls everything dumb, which gave her the perfect phrase to write on the fake plaques, and leaving Terry as the perfect red herring. I love the Halloween Heist episodes so much. Having Gina, whose secret genius is rarely given enough credit, win was a great way to go. I kind of figured something was up when she knocked her front teeth out and then didn’t demand they make a big fuss over her, but watching it all play out was still epic. My only disappointment is that I have to wait another full year for Halloween Heist V.